Why Hire an Austin Healey Frogeye Sprite? Quirky, fun days out with lots of admiring onlookers. That’s what awaits you with an Austin Healey hire. 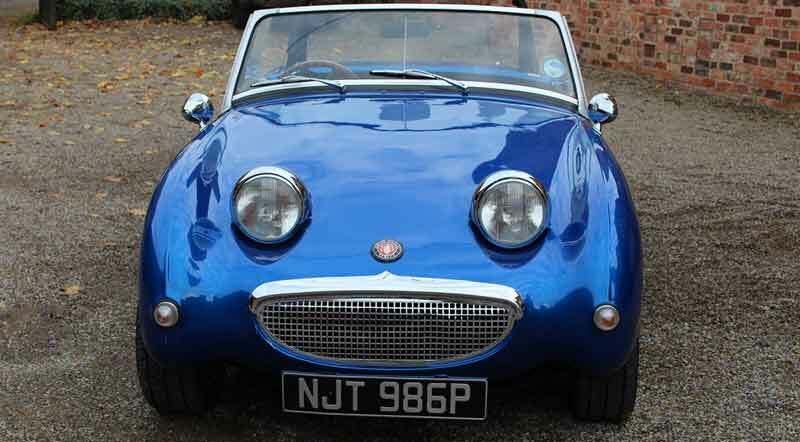 And, with its smiley face, there’s no sports car that looks happier than the Frogeye Sprite. 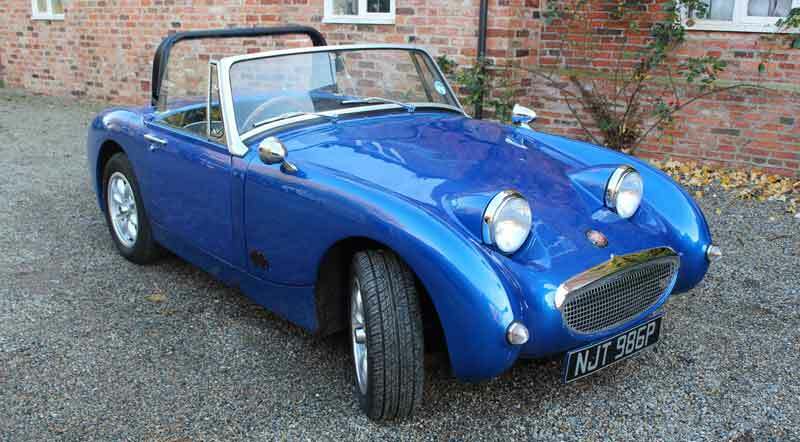 Our Sprite for hire in Yorkshire is bright blue with a black interior and black hood. It has a manual gearbox and minilite wheels. Hire the Austin Healey Frogeye Sprite for a special occasion or just treat yourself. A classic car hire gift voucher makes a terrific surprise birthday or Christmas present. Or hire this lovable two seater sports car for a unique self-drive wedding car or prom car. The Frogeye (or Mark I) Austin Healey Sprite was produced from 1958 to 1971. Our Frogeye is a 1976 version – strange but true. 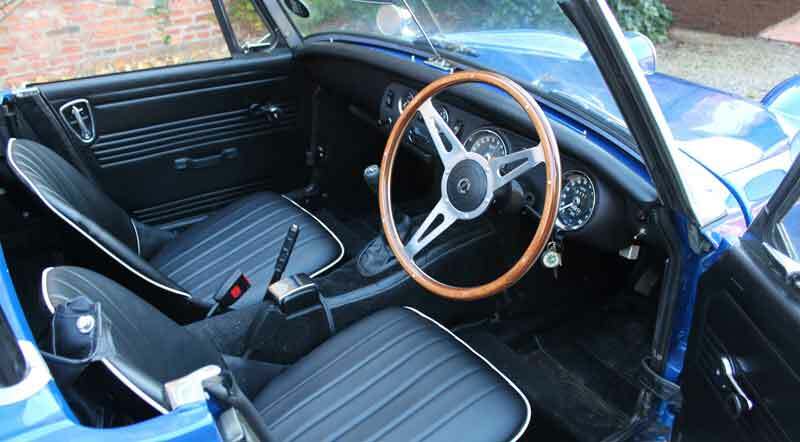 The explanation is that an MG labelled version of the Sprite called the MG Midget, slightly more expensive and slightly more upmarket than the Sprite itself – it even had external door handles! – was produced until 1979, becoming known as “Spridgets”. 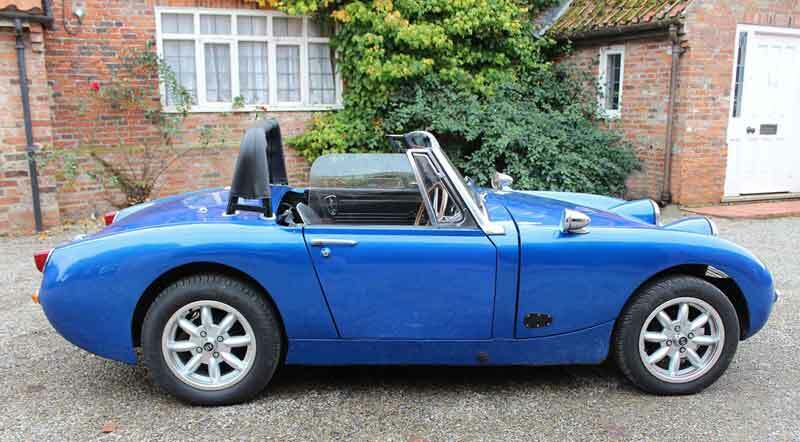 Our Austin Healey Hire car is actually a 1976 MG Midget rebuilt in 2010/2011 with a replica Frogeye Sprite body upgraded to include external door handles and proper wind-up windows instead of removable perspex side screens. Other improvements are the addition of a heater, a more powerful (1500cc) engine, disc brakes on the front wheels, an electric windscreen washer, upgraded suspension and Austin Healey 3000 seats. The headlamps were intended by the original designers, Gerry Coker and Les Ireland, to fold flat into the bonnet but a reliable way of doing this was found to be so expensive that the idea was dropped. The iconic Frogeye headlamps were the happy result which, along with the cheeky radiator grille, bring smiles to the faces of those who use this lovely little 2 seater as well as of passers-by. The Frogeye (or Mark I) Austin-Healey Sprite was produced for only three years, from 1958 to 1961. 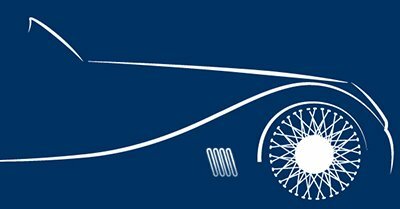 It was made by the British Motor Corporation (BMC) which had been formed in 1952 on the merger of the Austin Motor Company and Morris Motors, which itself owned MG, Riley and Wolseley. BMC capitalised on the name of the much more powerful and highly successful Austin-Healey sports car designed by Donald Healey, late examples of which now sell for well over £50,000, also manufactured by them. The big Healey’s baby brother, the Frogeye Sprite, can be thought of as the 1950’s working man’s sports car, pretty well a 2 seater version of the Morris Minor with which it shared various parts, including the same rack and pinion steering system and the same 948cc engine. When first produced it cost just £455 plus tax! The Frogeye was replaced by a rather dull Mark II version in 1961, itself replaced by equally dull Mark III and then Mark IV versions in 1964 and 1996 respectively. Production finally ended in 1971. Only the Mark I version, known as the “Bugeye” in America, had the “Frogeye” headlights built into the bonnet which help make the car so popular now. The later Mark II, III and IV versions had conventional placed headlights built into the front wings. Compared to a modern car the performance of the original Mark I Sprite can only be described as very slow. According to a 1958 Road Test it took over 20 seconds to get to 60 mph – and that’s for what was called a sports car! But maybe that seemed quite fast then – the original Morris Minor first went on sale only 10 years before the Frogeye and took over 50 seconds to get from 0-60 (about as fast as it would go). Our car has a 1500cc engine. While by modern standards no-one could call it fast, it will do 0-60 in around 15 seconds and can cruise all day at that speed or a bit more. Have tremendous fun with an Austin Healey hire (or MG Midget hire, depending how you look at it) in Yorkshire. Our ‘Spridget’ gives you best of both. Top speed about 90mph – 0-60 in 15.0 secs. No boot, but there is space behind the seats for a small bag.